We report the case of a 14 year old healthy boy, who was admitted six weeks after being injured by a palm tree thorn, with limping caused by pain and swelling in his right knee. An ultrasound examination revealed a foreign body in the posterior lateral aspect of the right knee. Pantoea agglomerans was identified in the synovial fluid. The patient underwent two arthrotomies and was treated with amoxicillin-clavulanate intravenously for three weeks. The postoperative course was uneventful, and joint function returned to normal. A review of the literature between 1953 and 2002 revealed that bacterial growth after plant thorn injuries is reported infrequently. Yet when reported, Pantoea agglomearns is the most common organism found. Therefore, it must be considered and suspected in “aseptic” cases of arthritis, when there is a history of a plant thorn injury. We also emphasise the efficacy of ultrasound examination in these cases to identify the presence and location of a plant thorn. A 14 year old healthy boy was admitted to the hospital with pain and swelling in his right knee. 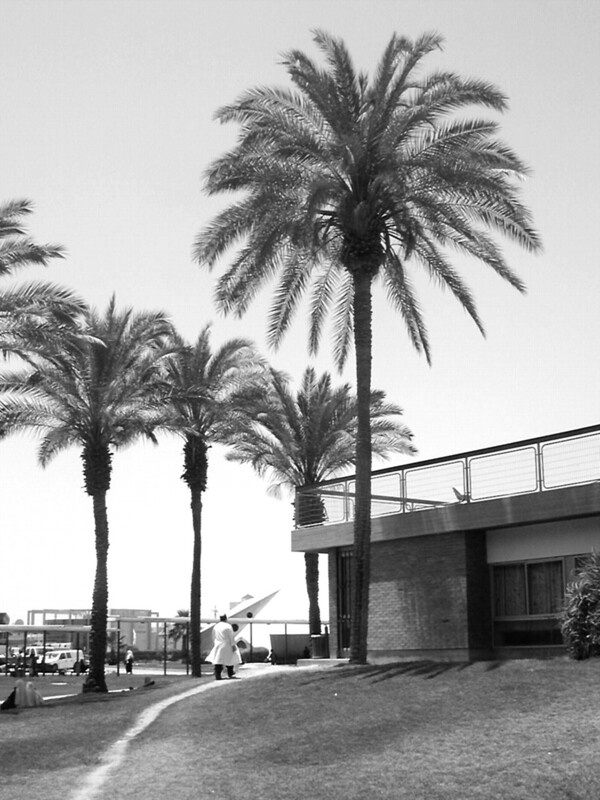 He reported that six weeks prior to admission he had tripped over a palm tree branch and a thorn had penetrated his right knee. At that time, mild swelling and pain had been observed in the area of his right knee, and he had been treated with oral amoxicillin-clavulanate (2 g/day) for 10 days. The swelling and pain resolved. Two days prior to admission, notable swelling and pain in his right knee was observed. Physical examination on admission showed an afebrile patient in good condition. His right knee was warm, swollen, and tender. Considerable limitation of active and passive range of motion was noted. Blood leucocyte count was 8.15 × 106 cells/l with 74% neutrophils. Erythrocyte sedimentation rate was 115 mm/h. Radiographs of the knee showed only soft tissue swelling, and no foreign body was detected. An arthrocentesis yielded 80 ml of purulent fluid. Direct microscopic examination of the fluid revealed many leucocytes, but no bacteria. Laboratory examination of the joint fluid showed 92.8 × 106 leucocytes/l with 86% neutrophils. A radioisotope scan with technetium was performed, showing an increased uptake in soft tissue and in the articular space. The case was diagnosed as septic arthritis, and empiric treatment with cloxacillin (2 g four times daily) intravenously was started. Growth of a Gram negative bacillus from the joint fluid was detected in the BACTEC Peds Plus F broth (Becton Dickinson, Meylan, France). The final identification of the bacteria by the Vitec system (bioMerieux, Hazelwood, MO) was Pantoea agglomerans. Based on the strain susceptibility, treatment was replaced by intravenous amoxicillin-clavulanate (3 g/day). 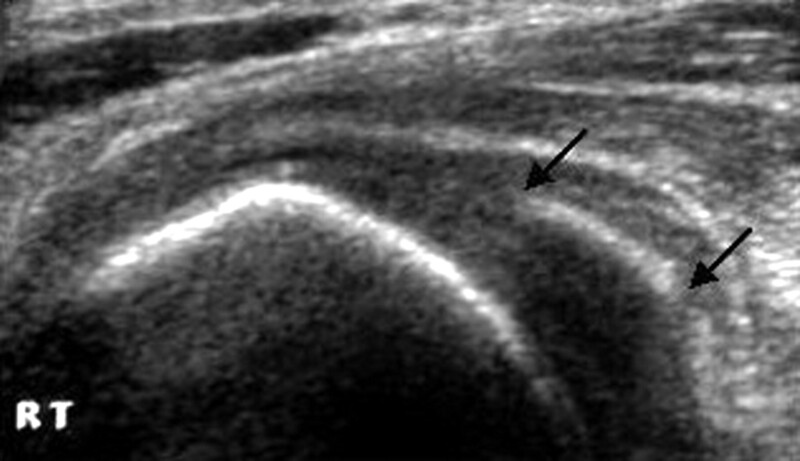 Ultrasound examination of the knee showed fluid accumulated in the suprapatellar bursa, and a foreign body, approximately 8 mm long, in the posterior lateral aspect of the knee (fig 1). A foreign body with approximate length of 8 mm (the date palm thorn) is seen in the posterior lateral aspect of the knee (between the black arrows). The patient underwent an arthrotomy with joint irrigation, but no foreign body was found. Intravenous antibiotic therapy was continued; the patient remained afebrile, and the swelling decreased, but there was still a limited range of movement and no further clinical improvement. The erythrocyte sedimentation rate was still raised (100 mm/h). A second ultrasound examination showed fragments of the foreign body lateral to the former location. The patient underwent a second arthrotomy. A small pouch, containing pus and surrounded by tiny fragments of thorn, was found and removed. Postoperative ultrasound examination revealed no trace of foreign body remnants. The patient remained hospitalised for one further week. The postoperative course, including a four week follow up examination, was uneventful, and joint functioning returned to normal. 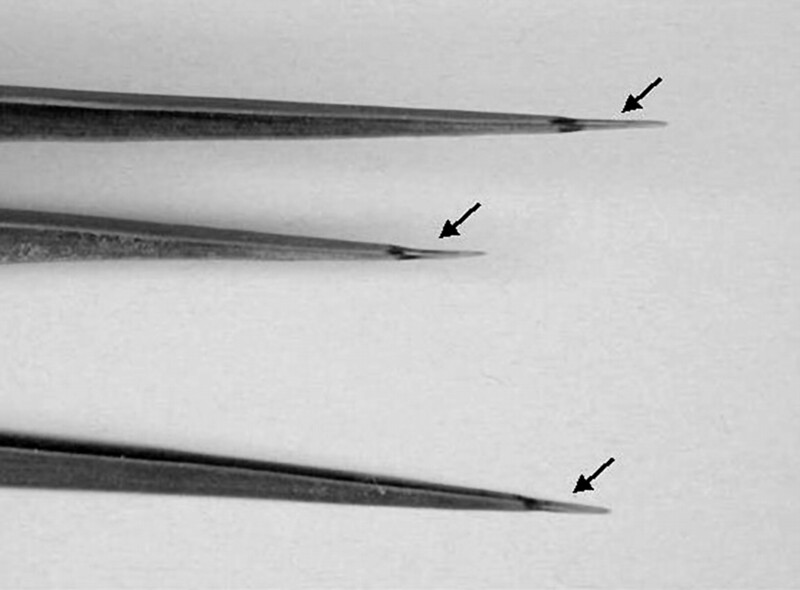 The thorn of the date palm (Phoenix dactylifera; fig 2) is particularly dangerous as the tip (distal 0.5–1.5 cm; fig 3) dries out much faster than the remaining parts of the thorn, and therefore is prone to break off within the joint, disintegrating into very small particles. The date palm (Phoenix dactylifera). The thorn tip of the date palm (0.5–1.5 cm) (black arrows). Historically, failure to discover an organism in the joint fluid after a plant thorn injury led to the hypothesis, first published in 1953,2 that the arthritis or synovitis after these injuries was the result of an allergic reaction, mostly caused by plant toxins, and hence was aseptic. A review of numerous reports of plant thorn arthritis and synovitis published between 1953 and 2002 revealed that reports of organisms found in cultures of joint fluid were very rare1,3–9 but when reported, Pantoea agglomerans was the most common organism (5 of 11 cases; table 1). Pantoea agglomerans has an important role in the pathogenesis of plant thorn arthritis after a thorn injury. It seems that many cases of “aseptic” arthritis after a plant thorn injury are actually Pantoea agglomerans septic arthritis. Inappropriate growth media and inaccurate identification methods could be the reason for negative results in culture identification. Therefore, the use of methods capable of recognising Pantoea agglomerans is recommended when a history of any thorn injury exists. An ultrasound or magnetic resonance imaging examination should be used to identify and locate suspected foreign bodies.12 Removal of the foreign bodies by arthrotomy, combined with antibiotic therapy, seems to be the most effective treatment to achieve complete recovery. Cahill N, King JD. Palm thorn synovitis. J Pediatr Orthop1984;4:175–9. Karshner AG, Hanafee W. Palm thorns as a cause of joint effusion in children. Radiology1953;60:592–5. Kelly JJ. Blackthorn inflammation. J Bone Joint Surg1966;48-B:474–7. Sugerman M, Stobie DG, Quismorio FP, et al. Plant thorn synovitis. Arthritis Rheum1977;20:1125–8. Flatauer FE, Khan MA. Septic arthritis caused by Enterobacter agglomerans. Arch Intern Med1978;138:788. Stromqvist B, Edlund E, Lidgren L. A case of blackthorn synovitis. Acta Orthop Scand1985;56:342–3. Olenginski TP, Bush DC, Harrington TM. Plant thorn synovitis: an uncommon cause of monoarthritis. Semin Arthritis Rheum1991;21:40–6. De Champs C, Le Seaux S, Dubost JJ, et al. Isolation of Pantoea agglomerans after plant thorn and wood sliver injuries. J Clin Microbiol2000;38:460–1. Freiberg AA, Herzenberg JE, Sangeorzan JA. Thorn synovitis of the knee joint with Nocardia pyarthrosis. Clin Orthop1993;287:233–6. Bottone E, Schniereson SS. An emerging human pathogen. Am J Clin Pathol1972;57:400–5. Schniereson SS, Bottone E. Erwinia infections in man. CRC Crit Rev Clin Lab Sci1973;4:341–55. Stevens KJ, Theologis T, McNally EG. Imaging of plant-thorn synovitis. Skeletal Radiol2000;29:605–8.